The skiing: The Vallée Blanche is entirely off-piste, unmarked and unpatroled. The weather alone determines snow conditions. Plan on spending 4/6 hours depending upon conditions, route chosen and group level. Price: 380 euros for guiding fees a group up to 4 personns. 30 euros more per extra personn above 4 personns. For the safety maximum 6 personns per guide. The lifts are not included. Note: The cable car is free with an unlimited valley skipass (62 euros for the 1 day unlimited pass including train lifts) and costs 49 euros (one way to Aiguille du Midi) if there is snow down to Chamonix. Dates: Every week-end (and during the week) from mid february until mid-may, depending on the snow conditions. Early meeting with your Mountain Guide at the bottom of Aiguille du Midi lift. After checking your safety equipment and fitting your harnesses and avalanche tranceivers, you take the cable car. This ascend takes from Chamonix to 3842 meters about 20 minutes. The start of the Vallee Blanche route is accessed by a short snow ridge, fixed with rope handrails and steps, to reach a flat where you put on your skis/snowboard. The guide will usually clip you on to a rope to ensure your safety. There are many routes down the Vallee Blanche, so the guide will choose the best depending on the level of your group. 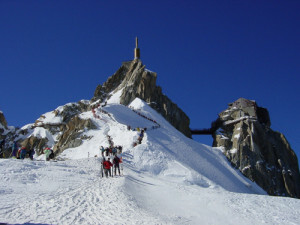 All of the routes converge at the Requin mountain hutte, where there is a restaurant. From the Requin you descend over the snow bridges through the Salle à Manger icefall, and the guide will show the best passages through the towers of ice for avoiding the crevasses. This section of the route is impressive, and also the most technically demanding. You need to have good ski or board control, with experience of side slipping and varying snow conditions from icy crusts to soft powder. Soon you reach the easier, flatter surface of the Mer de Glace glacier, where boarders are advised to have some telescopic poles or keep up a good speed. It is a fairly straight run down towards the Montenvers mountain railway station, from where you can catch the mountain railway to Chamonix. If there is good snow conditions at the bottom of the valley, you may be able to descend all the way through the forest down to Chamonix. Normally you arrive in mid afternoon. Price: 380 € for a group from 1 up to 4 personns; 30 euros per extra personn above this number up to 6 personns. We advise you against bigger groups. The lifts are not included. 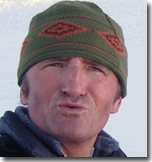 Because of the conditions of the mountain, the level of the group and others, the guide could organize a different planing or even a different descente somewhere else.